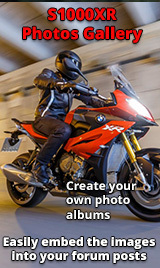 Got tired of the incredible infection of spam on the US BMW S1000XR so moving here for good info. I'm right up against the Blue Ridge Mountains in Virginia so if you're ever here in the States, be sure to give me a holler and I'll give you what we call the nickel tour! :) I may be on my Motus though. Let's settle this the old-fashioned Navy way, first guy to die; loses. S1000XR with Motus MST-R for backup. Firefighter, Motor Officer, Paramedic, Leatherneck, Former Action Guy. Been there, done that, got the t-shirt. Hello Danny and welcome to the forum. Welcome! Good to have another member who speaks proper English instead of the metric version of it that most people here use. This is a great forum. Lots of fun blokes... er... people here. You can learn something now and then too. you won't learn a fookin thing here but the food's cheap and the chicks are easy. Those used to be my stomping grounds before I moved to TX. It's a shame, didn't really meet too many people with S1000XRs while in VA. Welcome. Yeah the other site has really had a lot of crap posting up lately. Moderators just don't seem to care. Love that part of the country your in and vacation up that way almost every year. Staying in Mineral Bluff over the 4th of July Holiday.